The Irish Housing Network said it took over the reception area of Blackstone’s Dublin offices for close to an hour. HOUSING ACTIVISTS MADE a surprise visit this afternoon to the Irish offices of one of the world’s largest private equity funds. 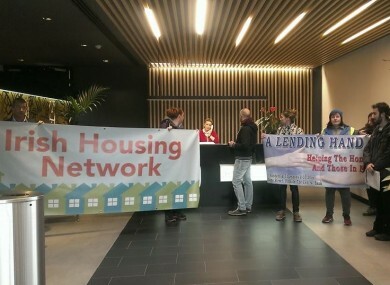 The Irish Housing Network (IHN) said it took over the reception area of Blackstone’s Dublin 2 offices for close to an hour as part of a day of demonstrations in solidarity with victims of the Spanish mortgage crisis. The Blackstone Group has been the target of a string of protests in recent months over its investments in the Spanish property market. Anti-eviction activist group Plataforma de Afectados por la Hipoteca has accused the New York-based firm, which spent €6.4 billion on Spanish home loans in 2014, of hiking rents and evicting residents in the Spanish properties it controls. Blackstone has denied the allegations, maintaining the company has not carried out a single eviction in the country. The firm paid around €100 million for three Dublin properties in Nama’s so-called ‘Platinum Portfolio’ last year. Members of IHN said they had hoped to present a representative of the company’s Irish arm with ”a short statement in solidarity with those suffering evictions across Spain”. “While Blackstone staff appeared reluctant to show their faces in public, [we] engaged in friendly banter about the recent budget cuts with a somewhat bewildered receptionist and security agent,” the activists said in a statement. Blackstone staff never came out of hiding and the action ended very peacefully shortly after 2pm. The group said the demonstration was also aimed at highlighting how private equity firms take advantage of “knockdown” property prices here in Ireland. “The arrival of vulture funds into the Irish property sector could not be coming at a worse time,” IHN’s Niamh McDonald said. This is the last thing we need in the context of a full-blown housing crisis. Blackstone offices were targeted in demonstrations in 16 other cities today, according to organisers, with protesters using the hashtag #BlackstoneEvicts on social media to draw attention to the campaign. Email “These activists paid an awkward visit to the Dublin offices of a US vulture fund ”. Feedback on “These activists paid an awkward visit to the Dublin offices of a US vulture fund ”.